Just two days after his debut, Topps has outlined their initial plans for Bryce Harper cards and autographs. Now that Harper has played his first major league game, he is eligible for official rookie card status. Instead of letting speculation run rampant, Topps has already given the details of what collectors can expect over the next several months and give them time to plan accordingly. "[I am] really excited we found a way to get Harper into all of our products," said Mark Sapir, Vice President for Sports & Entertainment at Topps. "The team did a wonderful job moving quickly to make this happen and I think, ultimately, the collectors will benefit and be rewarded." Below is a look at what Topps has planned for Bryce Harper in 2012. Topps has also stated that Harper autographs will be in all remaining 2012 Topps baseball products, including sets not on this initial list. The card maker has an exclusive autograph deal with the Nationals outfielder. Bryce Harper has long been a centerpiece on the 2012 Bowman Baseball checklist. However, he is part of the Prospect inserts and the card is not be considered an official rookie card. His Prospect card is available in both Bowman and Bowman Chrome versions as well as numerous parallels. Retail packs have randomly inserted Bryce Harper autographs. Collectors can also look for Bowman Black Bryce Harper autographs numbered to 25. Finally, Harper is the second 2012 Bowman Baseball Lucky Redemption. Limited to 100 copies, the autographed card is done as though it were a 2012 Bowman rookie card. 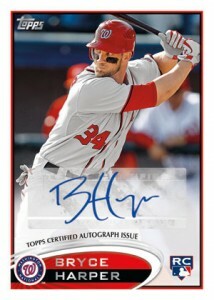 Topps has added Harper to the Fan Favorites Autograph checklist, however it will be a redemption. The on-card signature is in both hobby and retail packs and will use the 1984 Topps Baseball design. Harper is also an addition to the base set, albeit a short printed one. The 2012 Topps Archives Bryce Harper rookie is #241. Bryce Harper has an official rookie card is in 2012 Topps Series 2 Baseball. A last-minute addition to the checklist, the card is number 661 in the set and is a short print. An autographed version is available in both hobby and retail packs. A total of 25 redemption cards are inserted, good for an on-card On the Rise rookie. The first readily available Bryce Harper rookie card, his 2012 Topps Allen & Ginter base and mini cards are produced in equal numbers as the rest of the set. Random Rip Cards have 'Mystery Redemptions' good for one of ten Bryce Harper Red Autograph mini cards. Like on the 2012 Topps Series 2 checklist, Harper is number 661 in the factory sets. The image is different from those used on the pack-inserted card. While these initial plans focused largely on base cards and autographs, Sapir expects game-used memorabilia cards featuring Harper this year as well. "I think his first game used rookie product is Bowman Platinum," Sapir said. "I am sure products like Triple Threads and Five Star will have really beautiful cards for Harper that include game used." He also said that the company is looking at the possibility of adding Bryce Harper autographs to the 2012 Topps Golden Giveaway program. 2011 Bowman Prospects Bryce Harper ROOKIE RC #BP1 PSA 9 Mint Hot!!! 2012 FINEST ROOKIE #73 BRYCE HARPER RC XFRACTOR REFRACTOR PARALLEL RARE SP! 2012 Bowman Chrome Prospects Refractors #BCP10 Bryce Harper Rookie #220 500! Do you know the print run on the auto version. Dave (ID 41835) � The autographed version is serial-numbered to 502.
do you know if the 2012 bowman harper auto from retail packs in SP or the same as the others? if it’s not SP then retail seems like a pretty good buy. Topps hasn’t released official word, but it certainly looks like that could be the case. His Blue Autographs are numbered to just 35, which would indicate there may have been were fewer to go around. How many Bryce Harper signed cards (Serial no. 661) were put into production? I have seen 25 and 35. Topps has not released that information officially. Thanks Ryan. My son (a nationals fan) got one at Wal-mart yesterday. He is ecstatic. Awesome! That’s all that really matters.